I Need a Kill Switch. I am a huge proponent of usability standards when it comes to software. I’m not advocating that everything be the exact same, but there are certain basic functions that should be included in every modern software package available today. 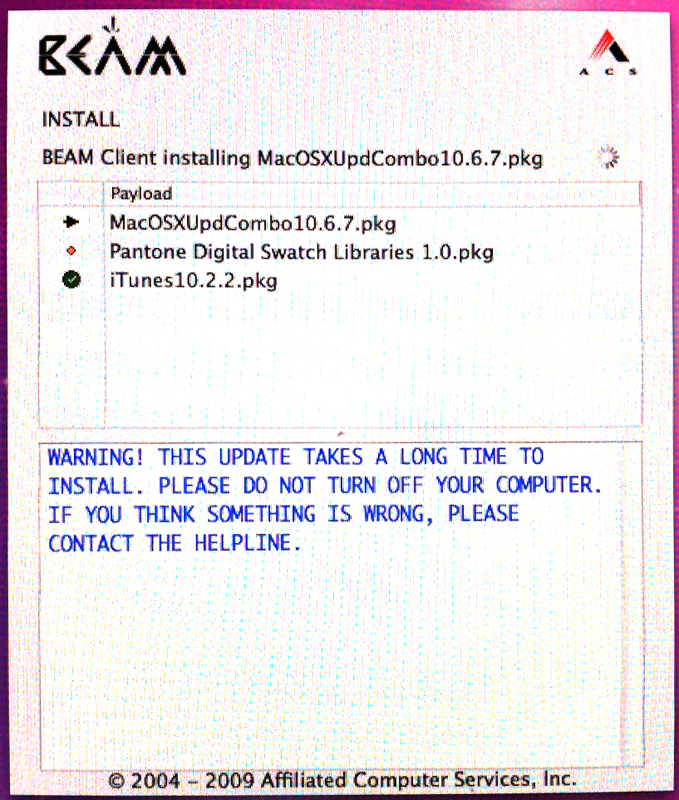 Here at work, we have a software updater called BEAM. It is a home-grown software package that violates one of the most basic usability functions every software designer should follow. There is no “Not Now” button. What I mean by this is, there isn’t a button that allows you to cancel the updates, and there isn’t a function that allows me to schedule my update for a more convenient time. Some of you are probably saying “so what? Does it really take up that much of your time?, and it is nice that your IT department checks to see if your computer needs updating or not.” Well folks here it is, I work with video and multimedia applications that require me to leave my computer on for days at a time. When I have an unfortunate incident where I am forced to restart (thank you After Effects for crashing my system), the last thing I want to do is wait for an update so I can get back to work. Especially if I am on a deadline. I just don’t get it. I know that there is probably some thinking that says if we give them a “Not Now” button, no one will ever update their computer systems. Or maybe it’s a “This way we can make sure all computers have identical software loads which will minimize tech support issues”, kind of thing. I don’t know. What I do know is this. Every modern piece of software designed in the last 10 years that does automatic update checks has a “Not Now” button. That is good usability design. That is good software design. Oh, look my computer just restarted. I’m going to wrap this up so I can get back to work. Written on WordPress for iPhone. Posted in Postaday 2011, Technology and tagged ACS, BEAM, postaday 2011, postaday2011, Software, Software Updates, Usability, User Interaction on May 11, 2011 by Author. Adobe Introduces Software Rentals “With Pay As You Go”. Yesterday Adobe announced an upgrade to its acclaimed Creative Suite. While there were a bunch of things in the software that would get any creative pro excited, the biggest buzz generator for me was Adobe’s announcement to lease, or rent software licenses. This is the first step that a software giant has taken to help offset my cost of working with their tools. Right now Adobe is offering Adobe Photoshop for $35/month, the Design Premium suite for $95/month, or the Master Collection for $129/month (for a year. It’s $195.00 on a month to month basis). While this pricing structure might sound a bit steep, think about the annual cost of renting the Master Collection versus Buying the upgrade. The cost of renting the Master Collection is $1548.00 a year. If you are a creative professional, that cost is offset as an operating expense, and can be either be deducted from your taxes, or passed on to your client. As for the cost of renting, while that $1548.00 a year sounds steep, Adobe announced that they are moving to a 12 month release cycle on software. The upgrade cost for the Master Collection is between $549.00 and $1399.00 depending on what software you are upgrading from. The majority of the upgrade prices are $1399.00. Right now this is less expensive than renting for a year, but your purchase is a one time cost deduction, compared with a monthly operating expense. You might want to consult with your accountant on how much you can deduct, but I’m thinking in the long run renting is the better deal. And if you pass the cost of renting on to your clients, there is the possibility that your rental cost zeros out. if you work 8 jobs a month, the rental cost passed on to your clients is $16.12 per client a month, a charge most client will be willing to swallow. Think of it as materials and supplies, which is something you haven’t been able to do with software before. As the new rental program moves forward, I’m sure the pricing structure will change. Hopefully the cost will come down as more people opt in for renting instead of buying. And hopefully Adobe will let you rent as you need to, rather than renting for a whole year. I really like the idea of being able to rent a software license when I need it, rather than locking into renting it for a predetermined block of time. Posted in Motion Graphics, Postaday 2011, Technology, Video and Motion Graphics and tagged Adobe, After Effects, CS5.5, Illustrator, InDesign, Master Collection, Photoshop, postaday 2011, postaday2011, Premier, Software, Software Rental on April 12, 2011 by Author. iPhone App of the Week. A few years back Autodesk bought Alias software and with it acquired one of the best drawing applications around. “Alias Sketch”, now “Autodesk Sketchbook Pro.” It’s still a great app and if you haven’t used it I say give it a try. You can get it here. What I am excited about is the new iPhone version that Autodesk released earlier this week. I have been using it for a couple of days now and it is one of the best drawing/painting apps I have seen for the iPhone. The SketchBook Mobile App uses the same software engine as Autodesk SketchBook Pro, delivering much of the same power and functionality as the desktop application. It features a combination of high-quality digital pencils, pens, markers and airbrushes, as well as an artist-friendly, gesture-based user interface, that enables users to create everything from quick sketches to print-quality production artwork. I have been using it for about a week and it just rocks. It is intuitive and powerful, and a bit more robust than applications for the iPhone Like “Brushes”. With the SketchBook Mobile App, Autodesk continues its long-standing tradition of bringing cost-effective professional design tools to creative professionals. Posted in Design and Art, iPhone Apps, Product Reviews and tagged Art and design., Autodesk, Creative, Design, Drawing, iPhone Apps. Photography, Painting, Software on September 18, 2009 by Author.